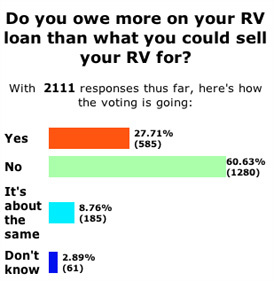 More than one out of four RV owners owe more on their RV loans than their vehicles are worth (“upside down”), according to a survey by RVtravel.com. Nearly 28 percent of the more than 2,100 recreational vehicle enthusiasts who answered the survey reported they owed more on their RVs than what they could sell them for. “It’s not uncommon for these RVers to be forced to dig deep into their pockets to unload their vehicle,” said Chuck Woodbury, editor of RVtravel.com. Woodbury and other RV experts say there are many reasons why RVers get in trouble with their loans. “They buy an RV with little or no money down and stretch their payments over too many years,” said Charles Davis of RV Financing. Davis said that in 2008, nearly all the RV loans of $100,000 or more his company arranged were for 15 or 20 years. Davis explained that the minute an RV buyer leaves a dealer’s lot his or her new RV becomes a used vehicle and generally drops about 20 percent in value from its selling price. RVers who finance their vehicles at significantly lower rates than offered by most other lenders are also asking for trouble. “The RV dealer will simply add thousands of dollars to the RV’s selling price to offset the low interest rate, in effect doing what’s known as a buy down or buying down the rate,” explained Davis. The problem gets worse when such an RVer trades in his RV to buy another one. Another alarming practice by some RV dealers is charging up to 125 percent of an RV’s value to compensate for a buyer’s upside down position when trading in an RV for a new one. Buying advice from RV experts Fifth Wheel trailers What RV is right for you?